Ashley Francois focuses her practice on a broad range of health care transactional and regulatory matters.Her experience includes working on a variety of health care transactions, including mergers, acquisitions, corporate reorganizations and joint ventures.Her experience also includes conducting and coordinating due diligence, preparing disclosure documents and schedules, and drafting a variety of health care related agreements. 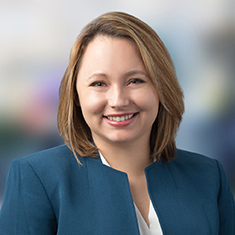 Ashley regularly advises clients on a variety of health care regulatory matters, including compliance with the Stark Law, Anti-Kickback Statute, the Health Insurance Portability and Accountability Act of 1996 (HIPAA), as amended, and various states' Medicaid regulations. Ashley also advises clients on the contractual and regulatory implications of health care entity change of ownership (CHOW) and related licensure matters. Shown below is a selection of Ashley’s engagements.